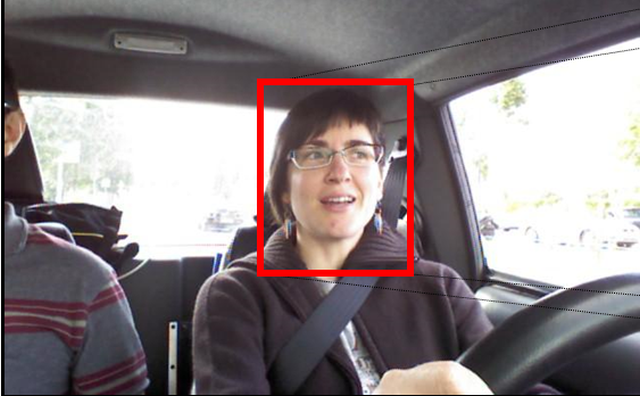 The DrivFace database contains images sequences of subjects while driving in real scenarios. It is composed of 606 samples of 640×480 pixels each, acquired over different days from 4 drivers (2 women and 2 men) with several facial features like glasses and beard. The ground truth contains the annotation of the face bounding box and the facial key points (eyes, nose and mouth). A set of labels assigning each image into 3 possible gaze direction classes are given. The first class is the “looking-right” class and contains the head angles between −45º and −30º. The second one is the “frontal” class and contains the head angles between −15º and 15º. The last one is the “looking-left” class and contains the head angles between 30º and 45º.